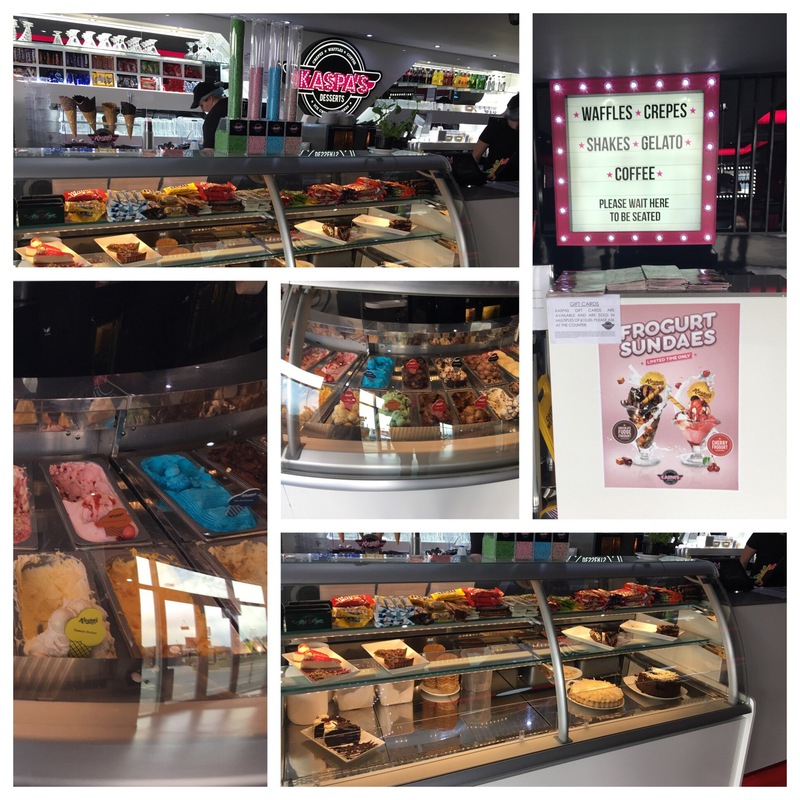 We finally visited the Kaspas in Broadstairs and we’re definitely going back! I met Emma a few days ago after what seemed like forever for brunch and a catch up with Emily and Adam. As the summer has been hectic, we’ve not had a chance to see each other much, what with work, kids being off school, planning for Sam’s 40th, holidays, weekends away and whatnot. Now that all of that seems to have died down, Emma suggested we should finally, finally, go to Kaspas, seeing as the first attempt of going to the gelato and Waffle House back in January in Canterbury was a disaster – order desk on ground floor, seating area upstairs with no step free access- a bit of a nightmare for 3 new mothers and 3 newborns. Thankfully, with the opening of the latest Kaspas in Broadstairs Westwood Cross earlier this year and it being in the old Majestic wine merchants building, everything is on one easy level. Filled with plenty of American diner style pink and black booths, chairs and tables, it does feel like we’ve landed on the set of Grease and Danny, Sandy, Kinicki, the Pink Ladies and the T-Birds are about to steal my fries and sing songs to one another, but that’s not what your going to Kaspas for, no! You enter just off the small car park at the front, to a glitzy Hollywood style desk and board. To the left is a huge glistening display of ice cream/gelato, in every damn flavour you could possibly imagine, alongside lots of sweet treats, chocolate, biscuits, you name it, on the bar that leads to a big coffee machine and a busy group of staff rushing around getting the most creative of milkshakes and sundaes ready for the crowd that slowly start making their entrance for lunch. 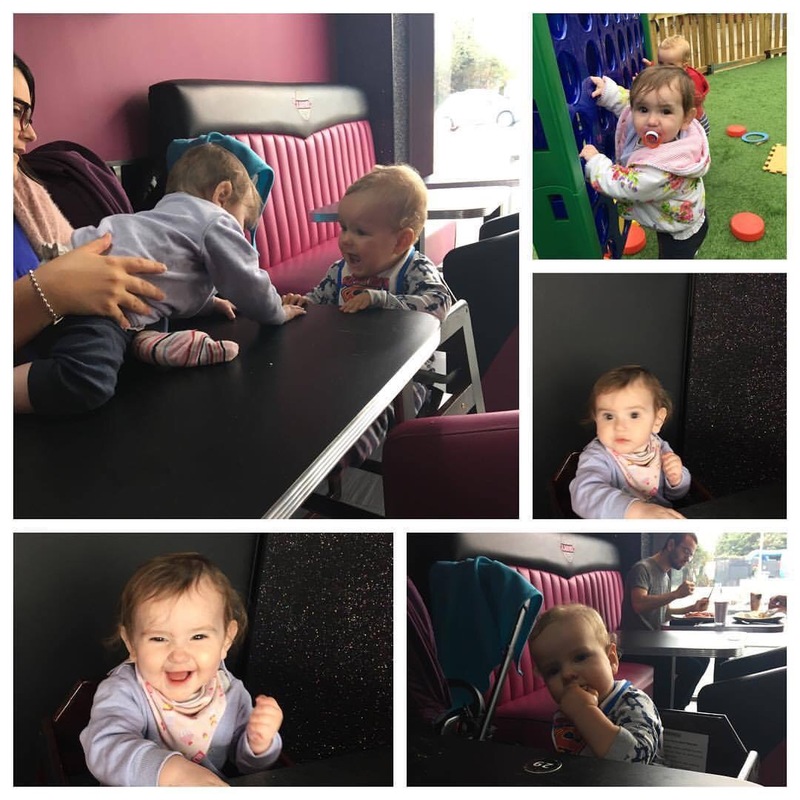 We were sat straight away by a really helpful young lady, who brought out 2 high chairs for Adam and Emily in a seated area that could accommodate both prams and our endless crap of toys, feeding accessories, teethers, dummies, baby wipes. 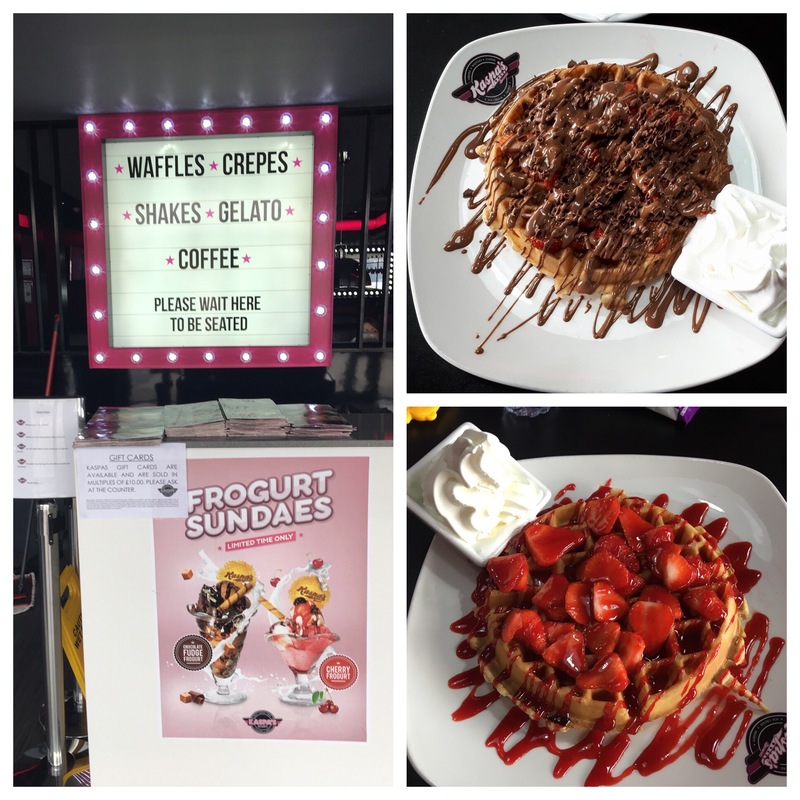 The menu is a glistening laminated menu with an ongoing list of Sundaes, Waffles & Crepes, Cakes & Puddings, Hot Drinks, Bubblemania and Milkshakes & Sundaes. We were expecting each dessert choice to cost an arm and a leg, but for two people, 2 waffles with ice cream (you can have squirty cream if you prefer) and 2 cups of tea, £14.50 was cheaper than we expected. After a lot, and I do mean a lot of drooling, Emma decided upon the Strawberry Indulge Waffle, a fresh waffle with served with fresh strawberry slices, drizzled with warm chocolate sauce and sprinkled with milk chocolate flakes. Not bad for £5.95. As for me, my eyes settled on the Strawberry Delight Waffle, a fresh waffle served with fresh strawberry slices and drizzled with our mouth-watering strawberry syrup. Also not bad for £5.50. The portions sizes weren’t too bad either. I was half expecting a mammoth waffle to be plonked onto my table, but our choices were enough for both of us. Too little to share, just right. Although seeing some of the other waffles on offer and friends suggestions, I think we both went for reasonably light versions of what we could have got. Washed down with tea it was the perfect combination of sweet and savoury. There’s no way I could have managed a waffle and a milkshake or sundae, that would have been just a little too much for me. Both Adam and Emily loved munching away on their snacks and making a mess but they also loved trying their mama’s slice of heaven too. Emily loved the combination of ice cream, fresh strawberries and strawberry sauce. A little naughty treat. I’ll definitely be coming back here again, with Sam, Emma or anyone else that favours this place. I can see how it’s such a favourite with everyone. I would avoid half term and weekends, we went about 11am and we were the first in the door. Within the hour there were about 10 more people seated and a couple getting takeaway, we didn’t even know that was an option. This place is great for couples with cosy little booths, catching up with mates, really for the whole family. It’s good value, has a fabulous selection of naughty treats, don’t expect anything to be healthy without some lashings of cream in it. The thing is, is if I go next time, what will I choose? Previous Post Do you really need to call your child Apple to be different?